Building on an already riff-roaring weekend extravaganza, Desertfest are ready to announce another onslaught of gnarly after-parties to keep you going well into the wee hours each & every night. After-parties are free to all ticket holders, but make sure to get in early to avoid hammering on the windows. Once again taking control of the Black Heart decks on Friday, and kicking the weekend off in whiskey induced style, are the raucous brother-sister duo of Family Woodard, spinning heavy metal for boozers and losers late into the night. We hear there will no requests unless it’s in the form of 'Rainbow Rising'. If that’s not degenerate enough for you, look no further than Street Can Collective at the Dev, dishing out everything from sludge, doom, funk, grind, soul’n’punk far past your bedtime. Making their Friday night Desertfest debut with a plethora of DJs is The Lounge 666 which is barely even beer spitting distance from The Dev - they’ll be covering ground from industrial and darkwave all the way through to 80’s sleaze bangers. Old Empire will also bring a half hour power-hour of the greatest tunes known to man right in-between OM and California skate rockers The Shrine at Electric Ballroom on Friday night. 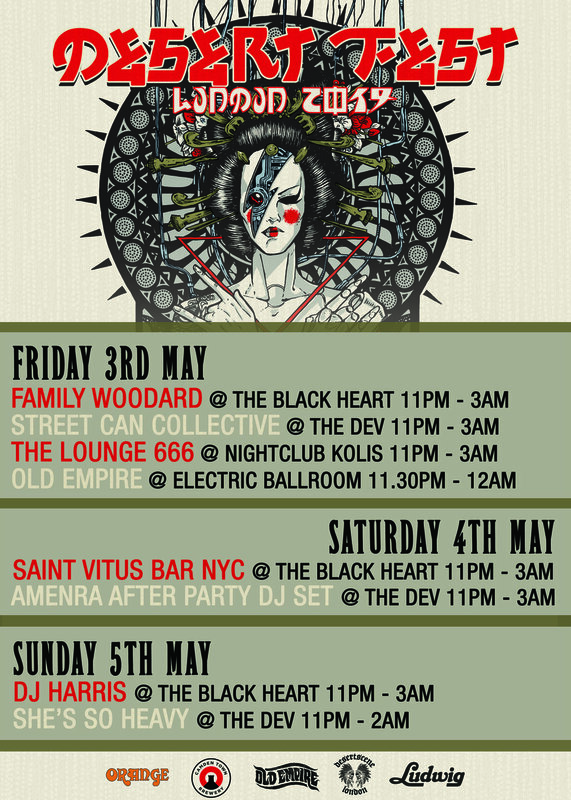 Hot off the heels of hosting Desertfest New York, the legendary Saint Vitus Bar bring their penchant for downing cheap beer and busting a move to Thin Lizzy over the pond from Brooklyn to the Black Heart on Saturday Night. Saturday Night headliners Amenra don’t let up, returning for the second time in one night for a danceable DJ set at The Dev. Frontman CHVE tell’s us to expect nothing but 80’s ballads and disco tunes - “Guns n Roses might possibly be the most extreme thing you hear from them all night!" She’s So Heavy fly the flag for female musicians at The Dev on Sunday Night - powered by a shared love of massive riffs, Julia (Grave Lines), Harriet (Black Moth), Fed (Black Moth) and Jess (Psychomagik) return not just to bring fist pumping heavy jams, but to celebrate women in rock everywhere. Quite possibly the unsung hero of Desertfest, DJ Harris brings his famed annual Desertfest closing party back to the Black Heart on Sunday Night. Lucha libre masks, stage diving off the DJ booth and rivers of tequila will ensue to hammer home the final nail into the bank holiday hangover coffin.